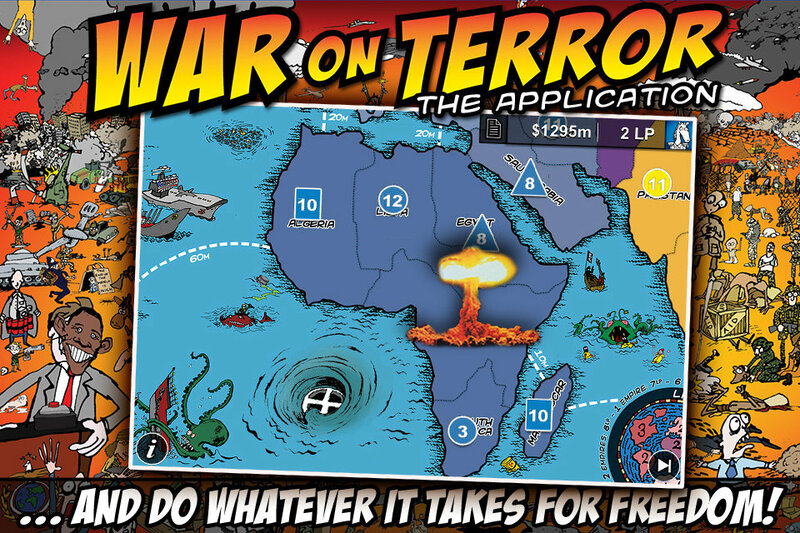 War on Terror is the iOS version of TerrorBull Games’ satirical boardgame of the same name. It has been said that the two topics of conversation you should always avoid at a dinner party are politics and religion, so it’s no surprise that (whether handled satirically or not) that by its very nature, War on Terror has the potential to be a hugely polarizing game. I’d venture to say that you’ll either “get it” and enjoy the game for what it is, or you’ll find it pretty darn offensive and objectionable. To give you an idea of what I’m talking about, here is fairly mild example from the second line of the game’s description: “In War on Terror you play a fledgling empire with the God-given duty to liberate the world, forcing your gift of Democracy onto the distant, dark-skinned, oil-rich cousins on the far side of the globe.” If this offends you, then you probably don’t need to read the rest of the review as there is far more (potentially) offensive content than this within the game (and even the instruction screens). I have a fairly high tolerance when it comes to jokes related to my religion, country and political views as long as they are not mean-spirited or in bad taste, so I went into this review with a very open mind. Involving a play style similar to that of the popular board game Risk, players attempt to retain control of entire continents (or “liberation points”) which are broken up into 49 individual territories. This is accomplished via a variety of means including waging war, funding terrorist activities, and even nuclear attack. To liberate a country, you either invade them by waging war or you can anonymously fund terrorists (hoping that they’ll handle the wet work for you). 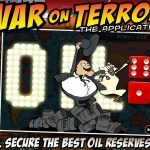 A turn consists of one or more of the following activities: developing your territories to increase their defenses and generate greater oil revenues (which equates to more funds), waging war or (believe it or not) funding Terrorism. After each turn players roll the “oil dice” which determines which of the territories produce oil, providing developed territories with (often much needed) funds. 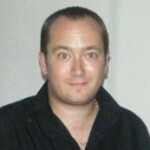 This is where strategy really comes into play and what was the most appealing aspect of the game for me. You need to see where you are vulnerable and attempt to build up these defenses, but at the same time you cannot just sit back and let everyone else do all the fighting, otherwise you’ll quickly find yourself with a lot less territories and (comparatively) a lot fewer sources of potential revenue. 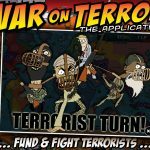 Waging war is pretty straightforward, but as I mentioned earlier, one of your potential actions is to anonymously fund terrorists. This is actually a multi-phased approach. First the Terrorists must be funded, so you must decide what size Terrorist cell you can afford (yes they come in sizes to fit any budget) and your cell must be at least as large as the development it is attacking. After all players have taken a turn, it’s time for the terrorist to attack. 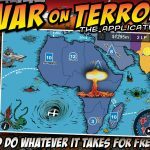 Finally, there is also a way to make temporary alliance with other players, which I could see as a really strategic tool in a multiplayer game, but since War on Terror is only a single-player game, I was never really compelled to try this with an AI foe. I have not had the opportunity to play the original board game on which this iOS version was based (which I suspect may have been more popular in its native England, than here in the States), so I cannot make direct comparisons. Honestly I have very mixed feelings about War on Terror. First and foremost, I felt that the game crosses the line a bit between being satirical and offensive. I know this may sound hypocritical coming from someone who plays games like Modern Warfare 3, and despite its propensity for graphic violence, I actually found Angry Mob Games’ dual-stick shooter Guerilla Bob, a less offensive “satirical” treatment of the subject matter. 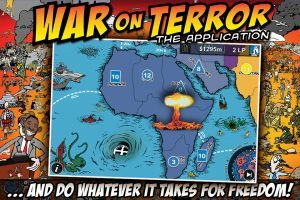 Don’t get me wrong, there is some nice strategical gameplay within War on Terror, but I think it unfortunately ends up getting overshadowed by the subject matter, which can (and will) turn off a lot of people. The gameplay itself feels a bit cramped on the the iPhone’s smaller screen and I really wished the developer had released the game for the iPad and taken advantage of the bigger screen real estate. Also, as it stands, right now the game is a completely solo affair, with players only able to compete against a number of AI rivals (3 to 5). Which means that unfortunately you’ll spend much of your time watching 3 to 5 nearly identical AI players trudge through their turns (mostly attacking everyone but you). Fortunately TerrorBull has thought to include a fast forward button which allows you to speed up gameplay during the AI players turns. The fact that you can only play as a single player also kills some of the opportunities for the sort of impromptu off-color gallows humor that would have otherwise surfaced during a group play session and what I suspect players probably enjoy about playing the physical board game in a group setting. For me, I have a fairly thick skin and as I said, I approached the review with an open mind, but in the end I guess the satirical humor of the game just went right over my head. With Armed troops still abroad, is it too soon for a game like this? Perhaps. 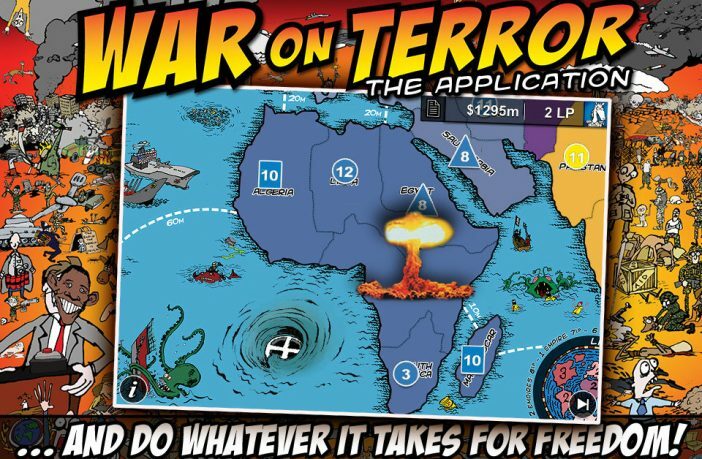 However, I’d actually argue the whole let’s make fun of “The War on Terror” was done to death during the Bush era and at this point this line of “material” may have already jumped the shark. I’m sure there is an audience for this type of game, and like much satire, mass appeal is virtually unattainable, catering instead to a niche audience. However with some changes in content this could be developed into a nice strategy game with broader appeal, though obviously that is not the game’s intent. War on Terror delivers plenty of shock, but just not enough awe.